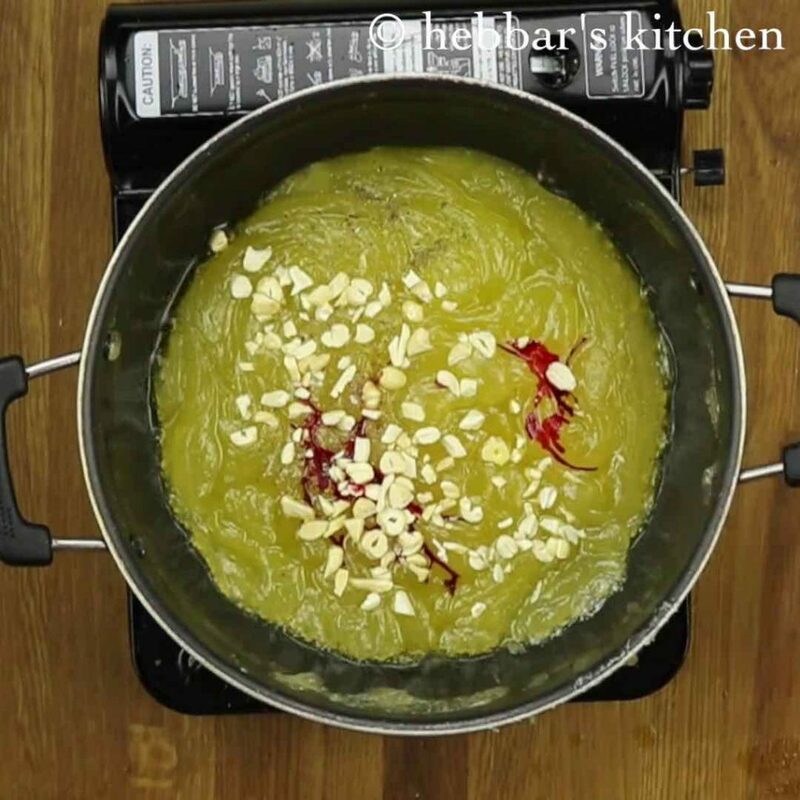 bombay karachi halwa recipe | corn flour halwa recipe with detailed photo and video recipe. basically, a chewy subcontinent dessert prepared with corn flour, sugar, ghee and flavoured with cardamom and dry nuts. 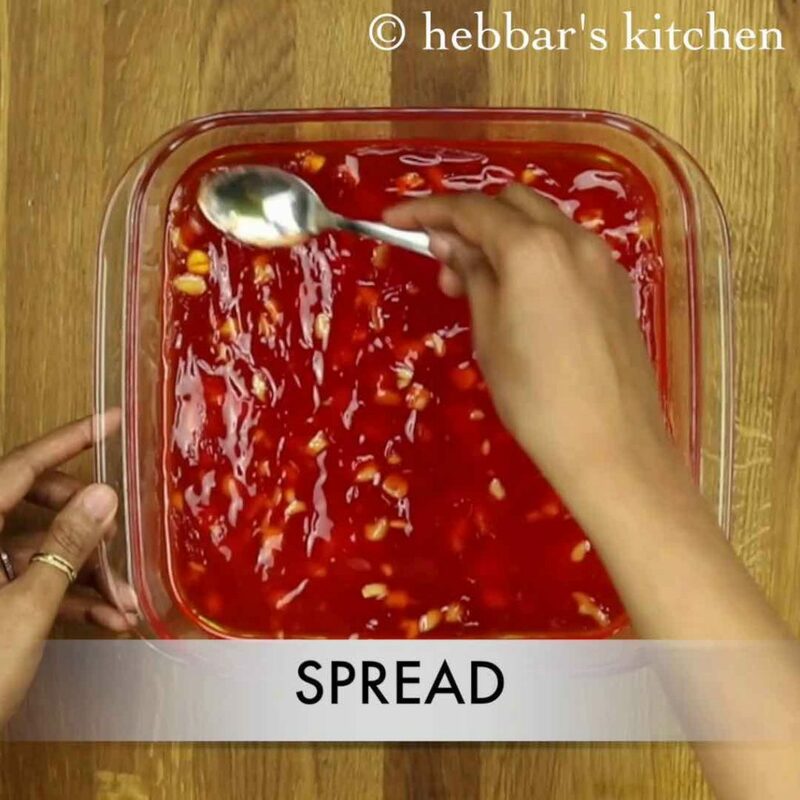 a popular and easy sweet recipe prepared especially during indian festivals like diwali and navaratri. 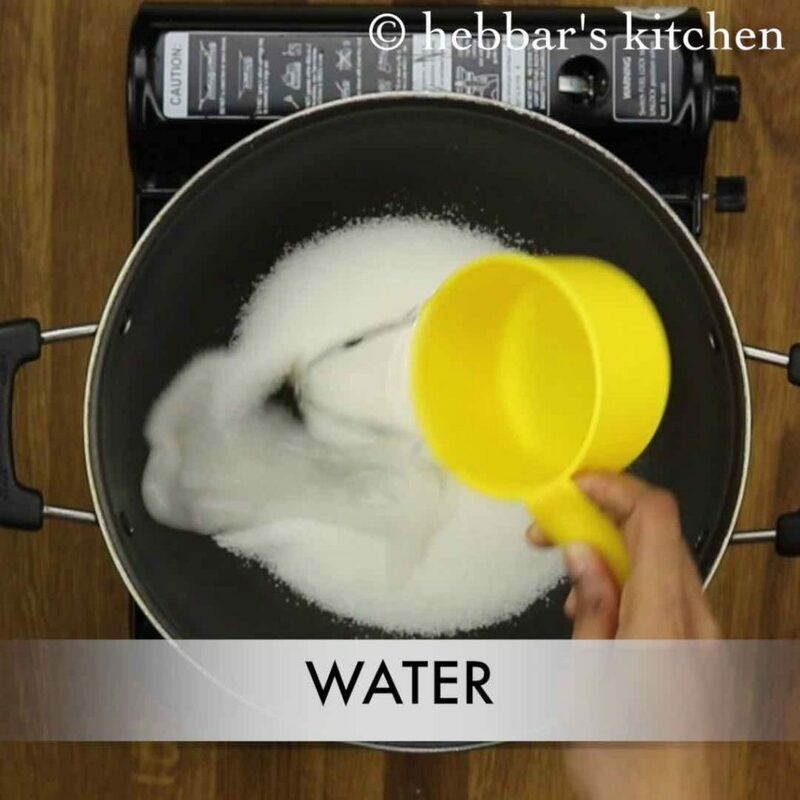 bombay karachi halwa recipe | corn flour halwa recipe with step by step photo and video recipe. the speciality of this exotic and flashy dessert is its elasticity. most commonly, referred as elastic dessert, is prepared especially during festival season. moreover, it could be easily shared with friends and family because of longer shelf life compared to other indian desserts. 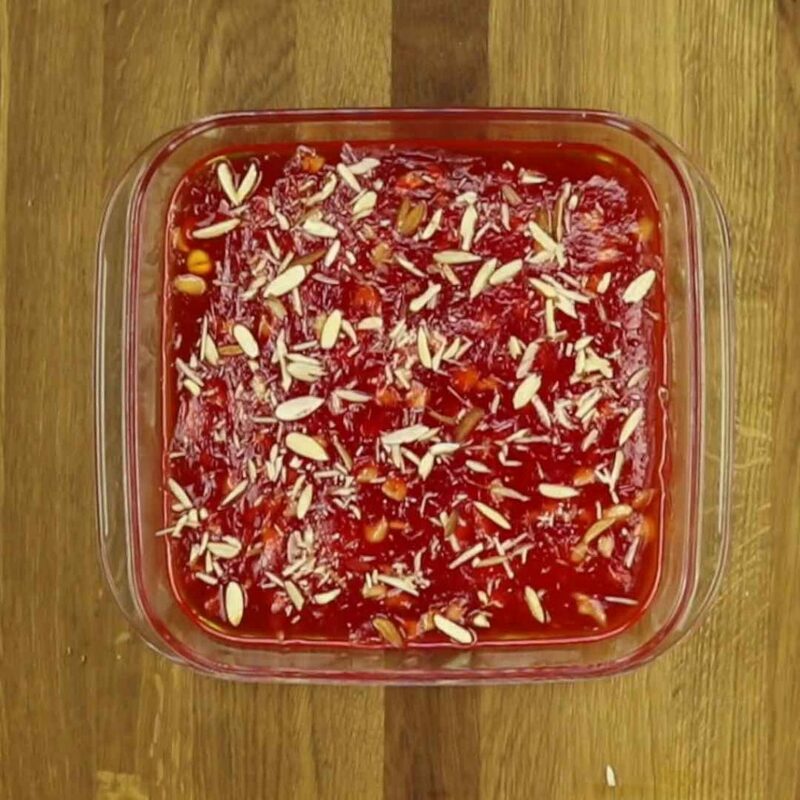 i have always been a huge fan of halwa recipes. 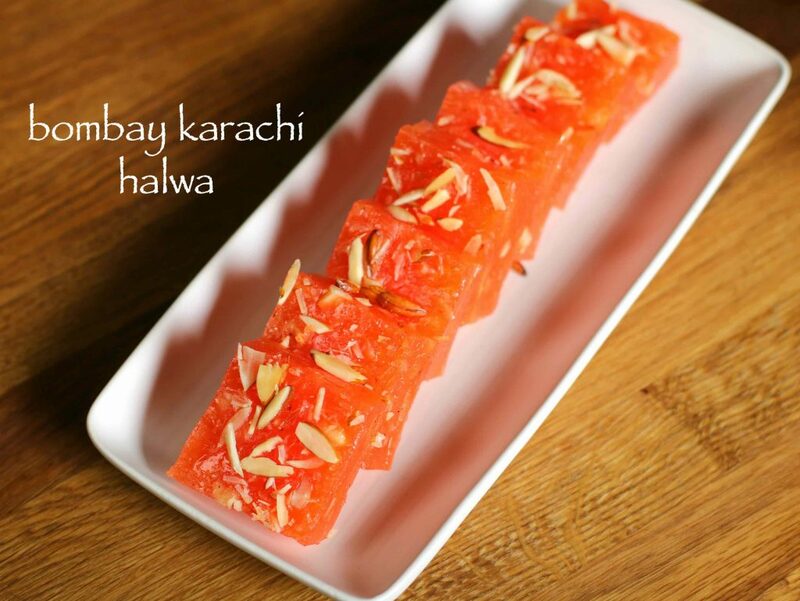 especially those halwa recipes which are chewy and more importantly flashy in nature. 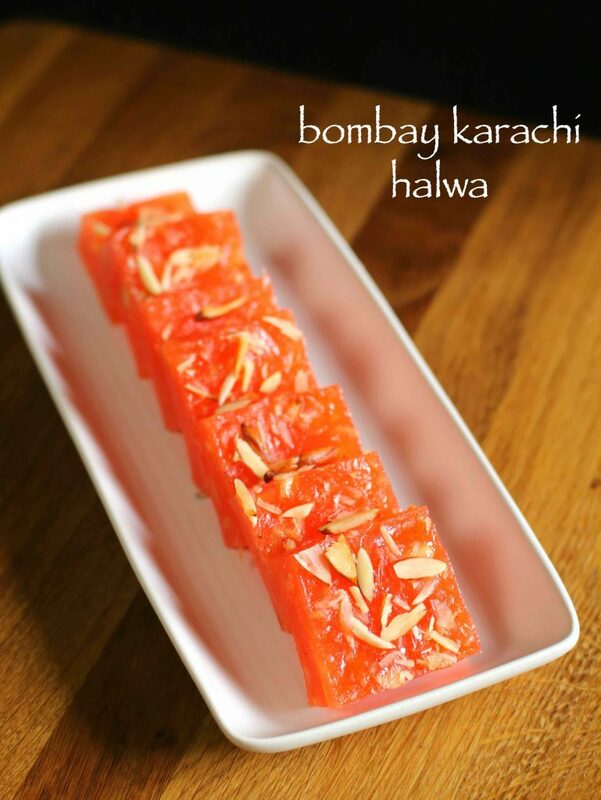 i still remember during my school days, as i use to buy this halwa in a local bakery for one rupee. moreover, it was sold with a variety of colours including lemon yellow, orange and red and pinkish colour. i always believed it was a plant extract and never knew it was prepared from corn flour. 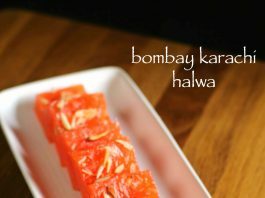 furthermore, some tips for a perfect chewy bombay karachi halwa recipe. 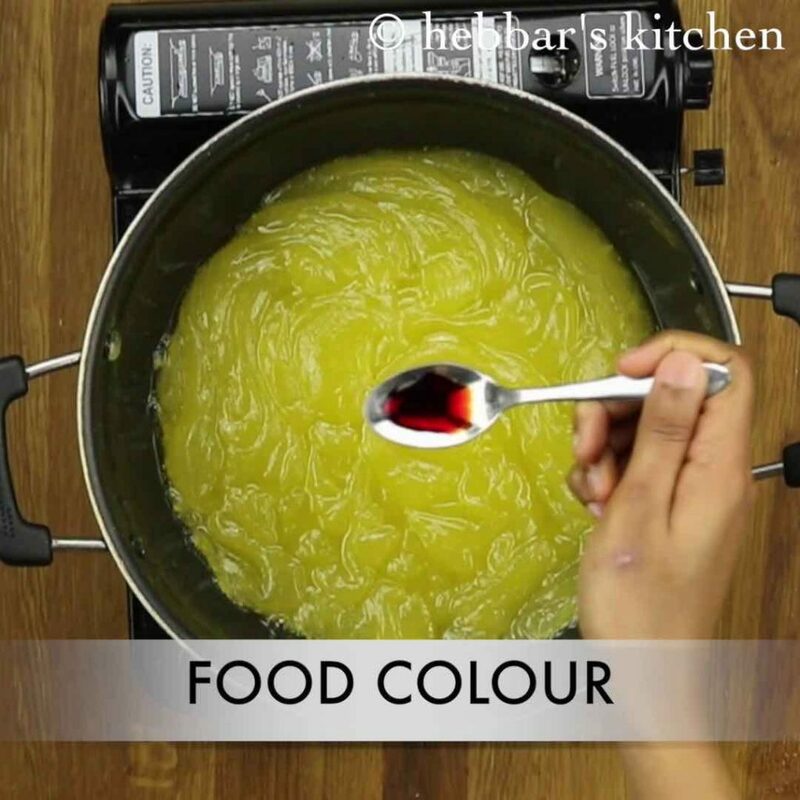 firstly, using the food colour in this recipe is optional and is added only to make it attractive. 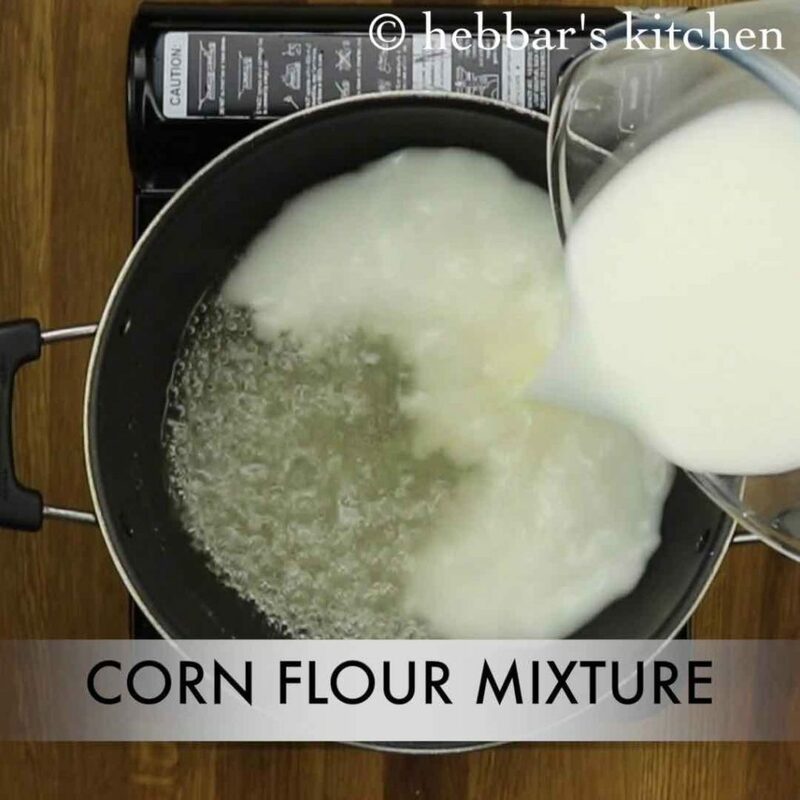 secondly, corn flour should be mixed with water without any lumps formed. otherwise, the halwa would not be chewy and properly cooked. 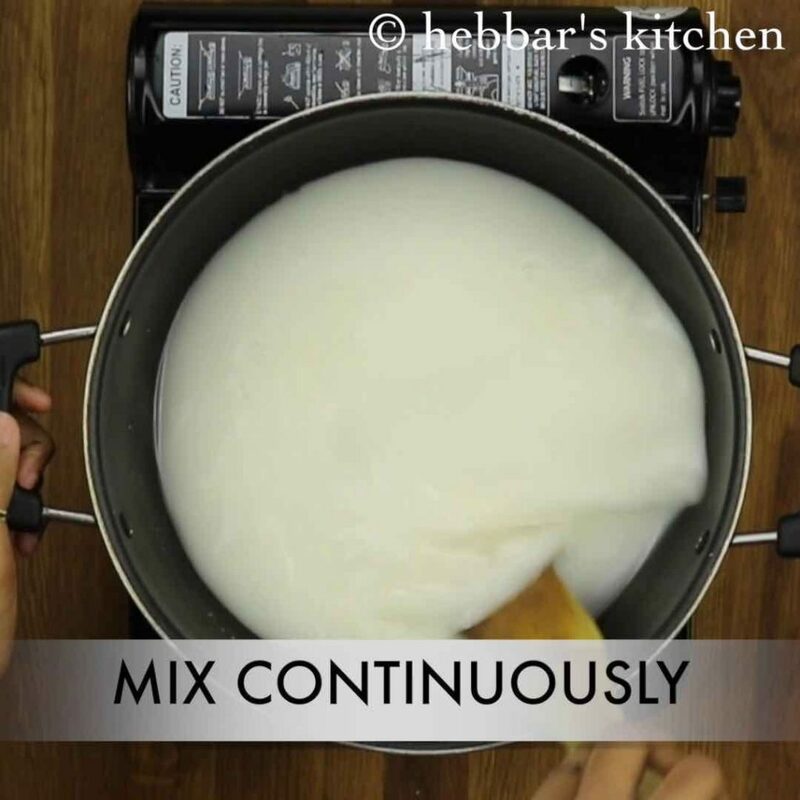 moreover, continuously stir while gradually adding cornflour mixture to the sugar syrup. lastly, do not compromise on adding ghee to corn flour halwa recipe. firstly, in a large mixing bowl take corn flour and water. mix well without forming any lumps. 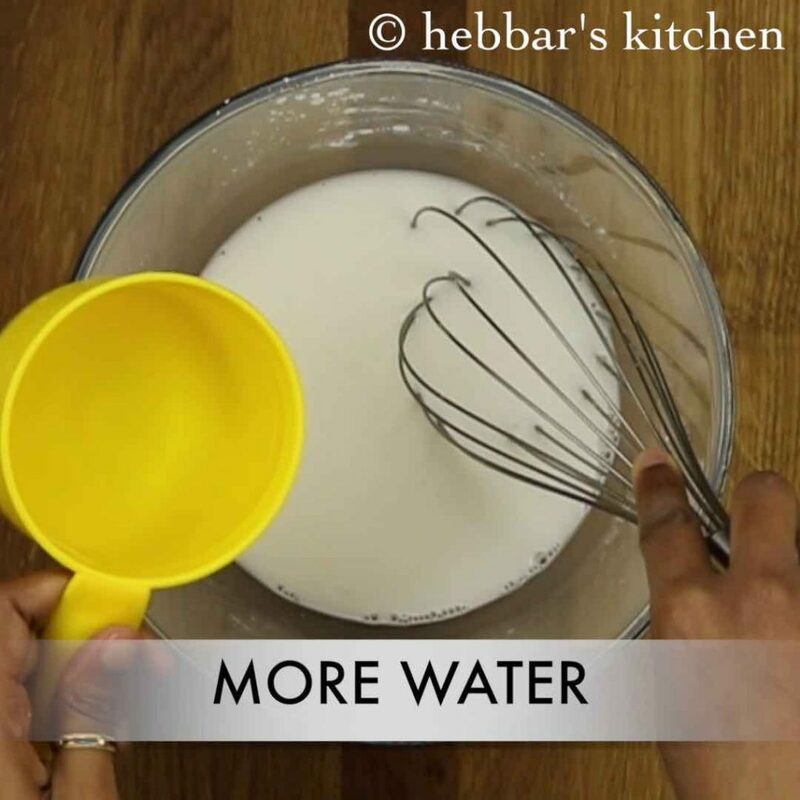 furthermore, add half cup of more water and continue to mix. keep aside. 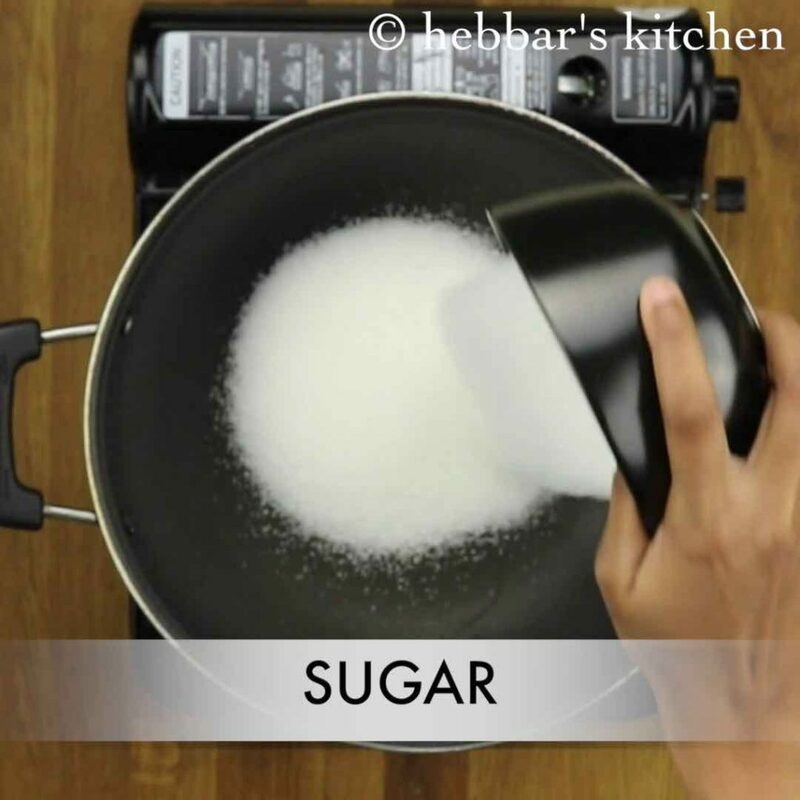 firstly, in a large kadai / non-stick pan take sugar add water. allow the syrup to boil. pour corn flour mixture into the boiling sugar syrup. furthermore, stirring continuously on low-medium flame. once the corn flour mixture starts to boil, and starts to thicken. immediately add a tsp of lemon juice. also keep stirring till the mixture thickens completely. now add a tbsp full of ghee. and mix continuously till all the ghee is absorbed. 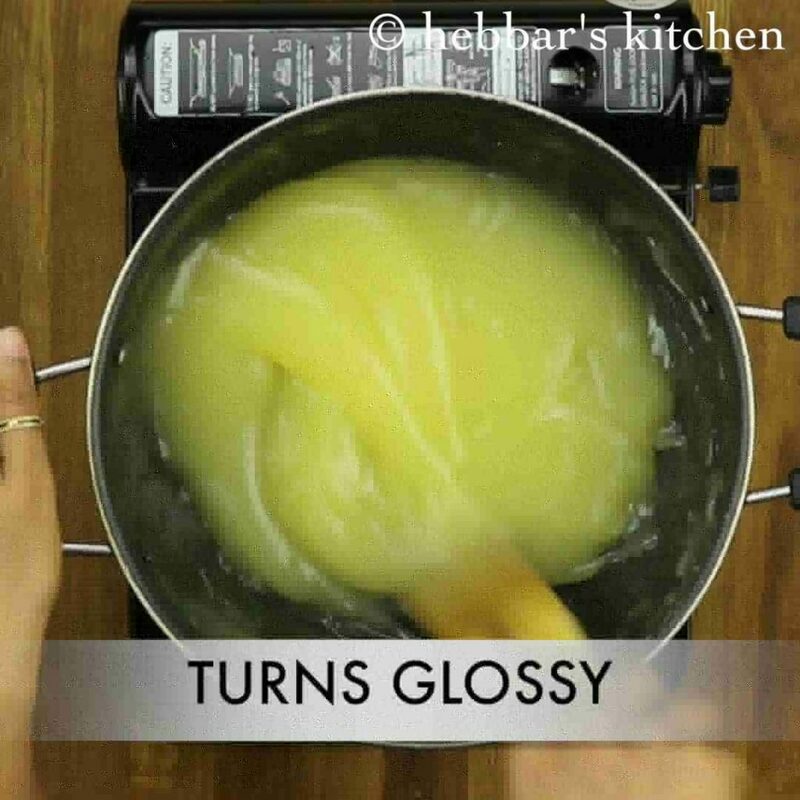 further, add another tbsp of more ghee and continue to mix till it turns glossy. then the mixture will start turning transparent and silky. releasing ghee from sides. add food colour, cardamom powder and chopped cashews. continue to mix till mixture will start to form a lump. later, transfer the mixture to a tray and level. also sprinkle some chopped almonds and rest for an hour. finally, cut to a desired shape and serve. firstly, in a large mixing bowl take half cup corn flour. further, to that add 1 cup of water. 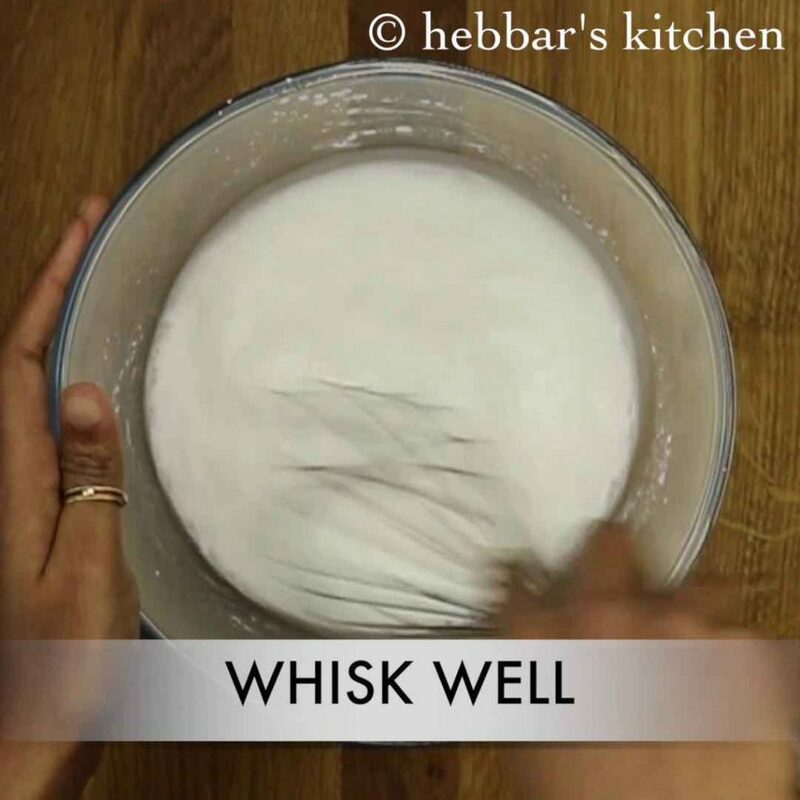 with the help of whisk, mix well without forming any lumps. further, add one cup of water and mix well. allow the syrup to boil. do not allow the syrup to get a string consistency. 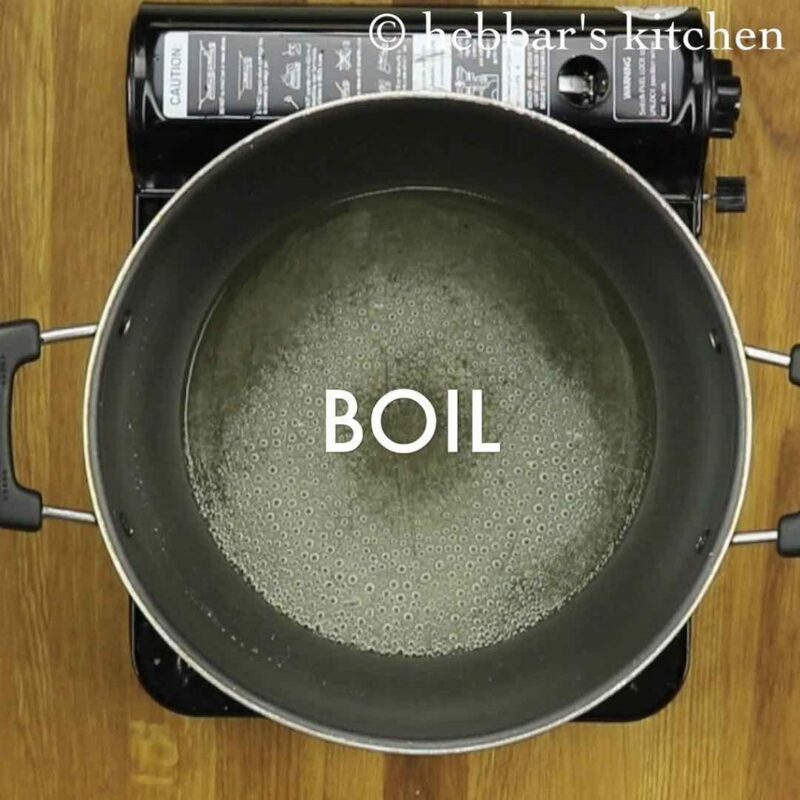 then mix the prepared corn flour mixture again and pour into the boiling sugar syrup. furthermore, with a help of spatula keep stirring continuously on low-medium flame. 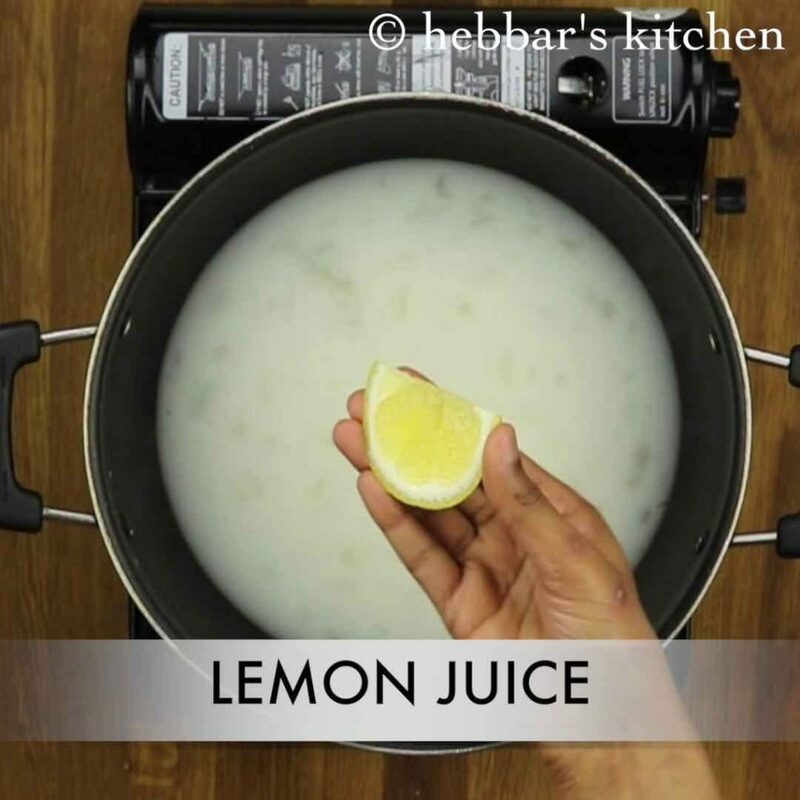 immediately add a tsp of lemon juice. this prevents sugar from crystallisation. 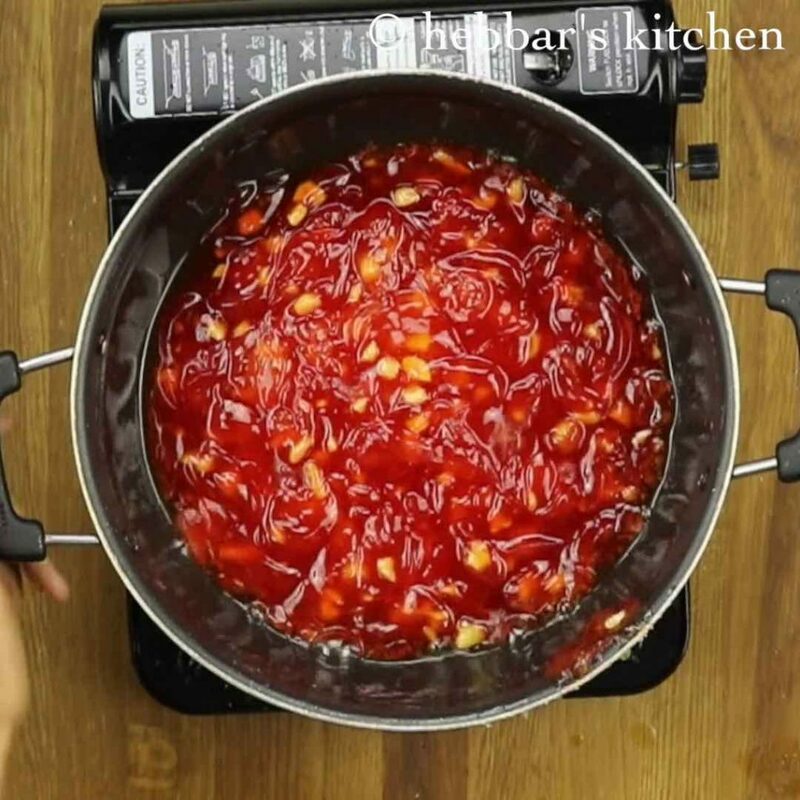 keep the flame on low and also keep stirring till the mixture thickens completely without any lumps. and begun to mix continuously till all the ghee is absorbed. repeat adding ghee 4-5 times in interval of time (total about 20 minutes). then the mixture will start turning transparent and silky. 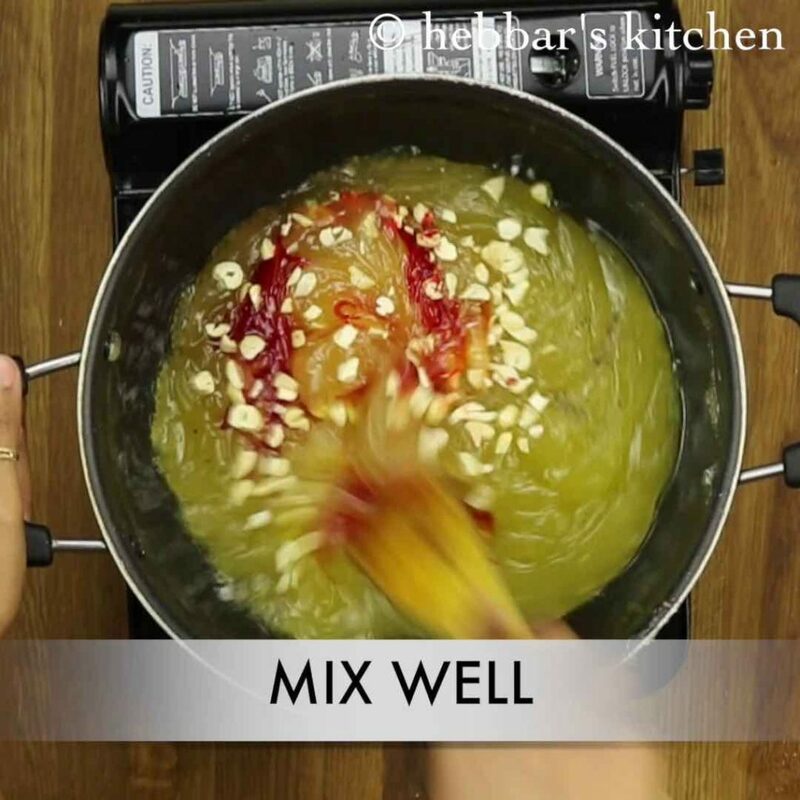 also the mixture will start releasing ghee from sides. then add cardamom powder and chopped cashews. continue to mix till the colour and cashews get distributed uniformly. and also the mixture will start to form a lump. do not over cook after this stage as the halwa will turn rubbery and more chewy. 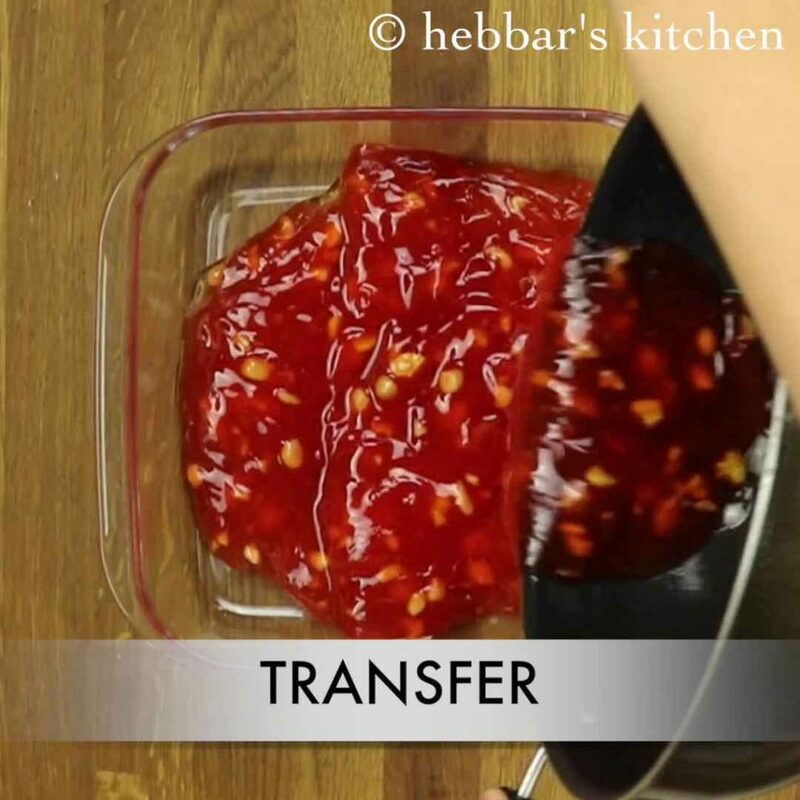 later, transfer the mixture to a tray or serve immediately. and level with a help of spoon. do it immediately, else the halwa will not be smooth. also sprinkle some chopped almonds to garnish. 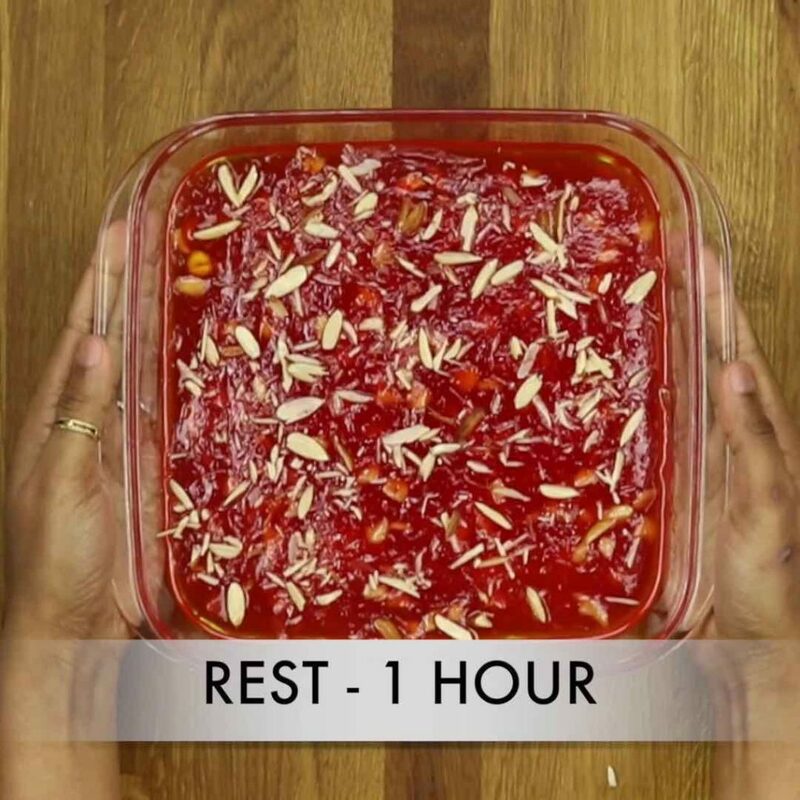 allow the halwa to rest for an hour or more. finally, cut to the desired shape and serve or store in an airtight container. 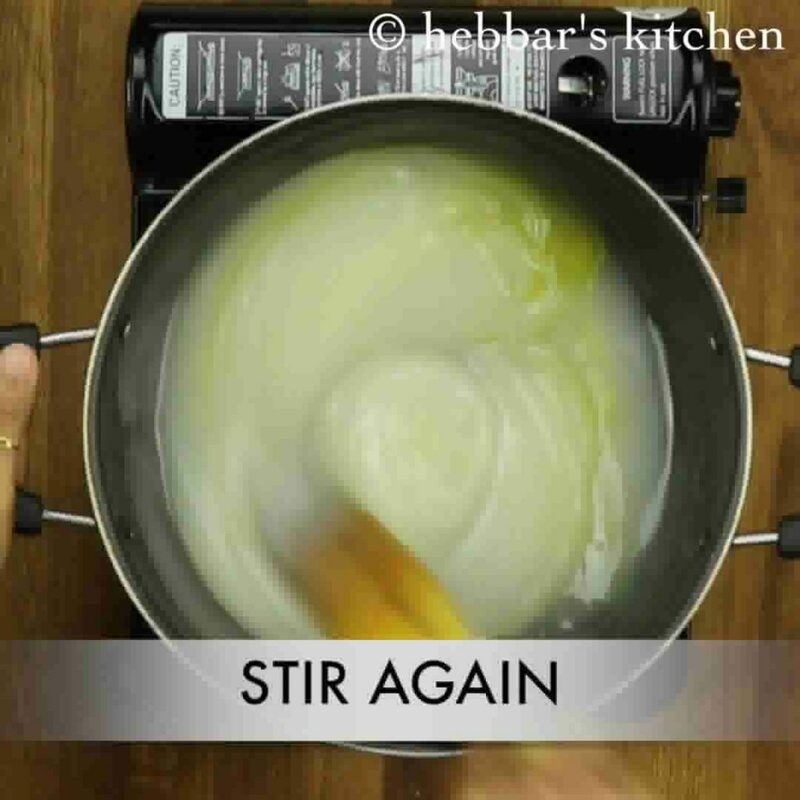 firstly, keep stirring continuously else lumps will be formed in halwa. 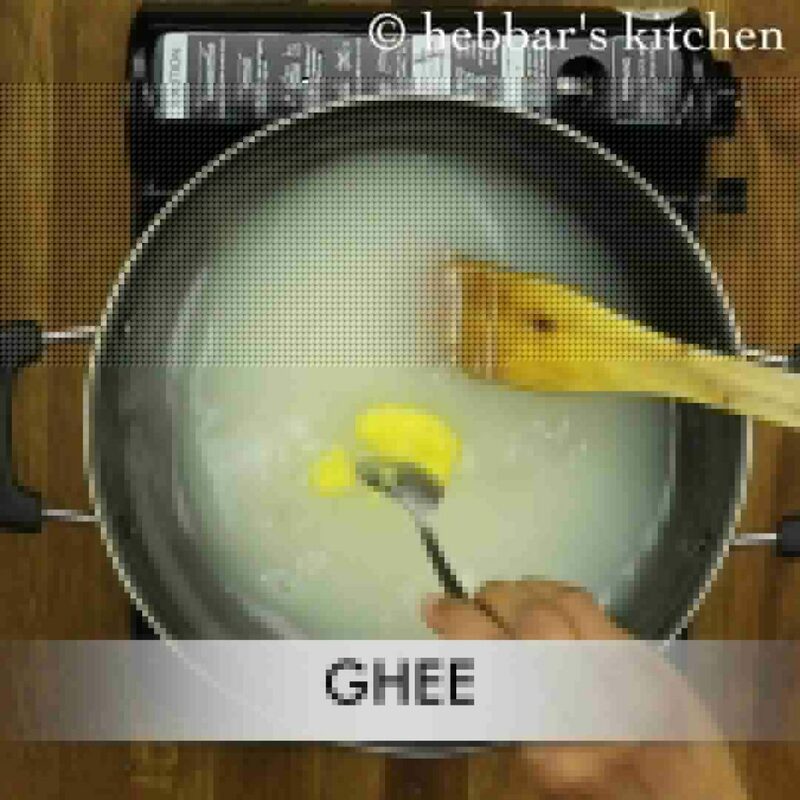 furthermore, add ghee at regular intervals as it doesn’t consume more ghee. additionally, add lemon juice without fail to prevent sugar from crystallisation. finally, use the colour of your choice and do not overcook as they turn rubbery and chewy. also undercooking will make halwa taste raw and sticky. Thank you. It came out welk in first attempt. Halwa turned awesome. Thanks a lot. Tried first time. how many days it can be stored? What’s the difference between corn flour nd corn stratch. Wow…. that was really easy…. I have just prepared it and I tasted it too… 😉 It’s really yummy…… I have tried many of your recipes ….. I am loving your recipes…. they are really cool and easy…. especially for the people who have entered “THE KITCHEN WORLD ” including ME…. Thank you so much…. you are welcome Sush. I am glad you liked it. where you are from? apparently in the USA the corn flour should not be used for this recipe and corn starch should be used for chewy halwa. What kind of corn did you use? Was it dissolving in water properly? What is your location? 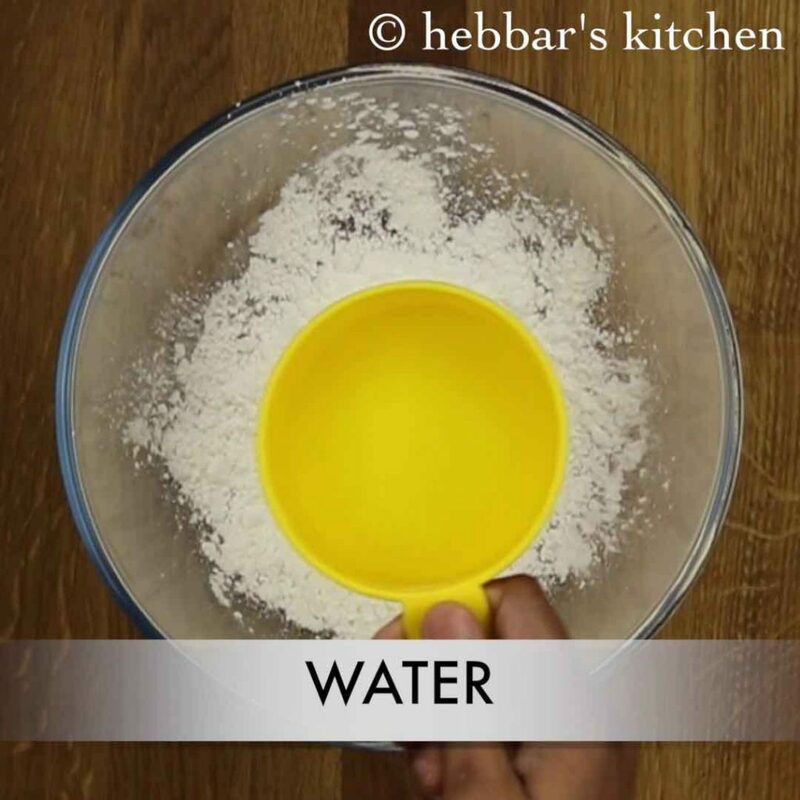 I heard that in US the corn flour is not soluble in water and corn starch should be used for this recipe. 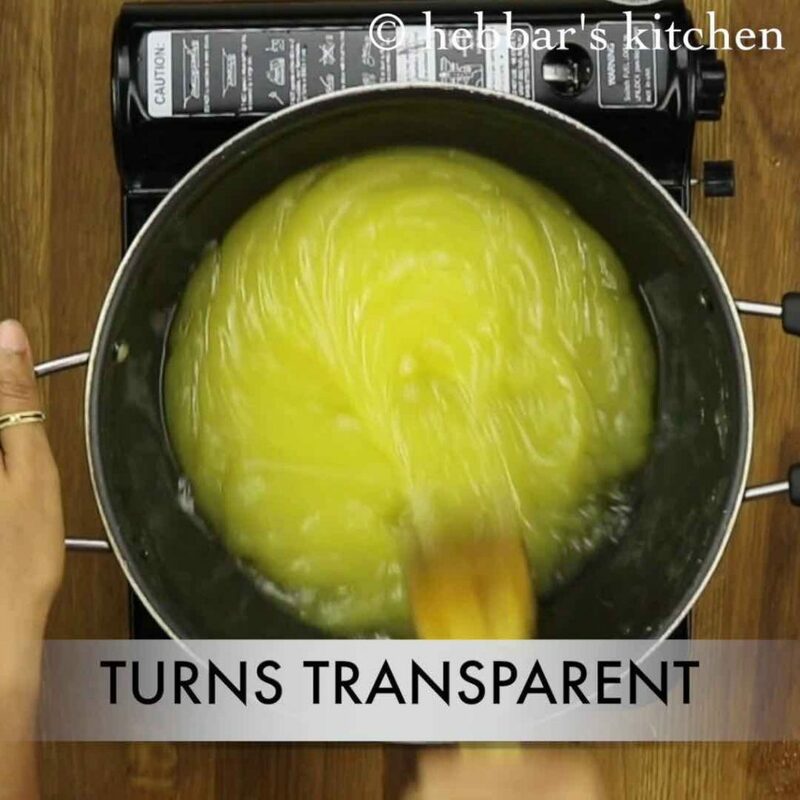 I follow the recipe step by step of Bombay Halwa but it did not turn transparent, why? I think all these recipes need cautions to be informed about issues related (in this case what will turn the whole thing TRANSPARENT?). We are immature cook doing for fun, but when we try as you mention and the dish turn different than what you show in video, we have to through it away and waste of time and money. 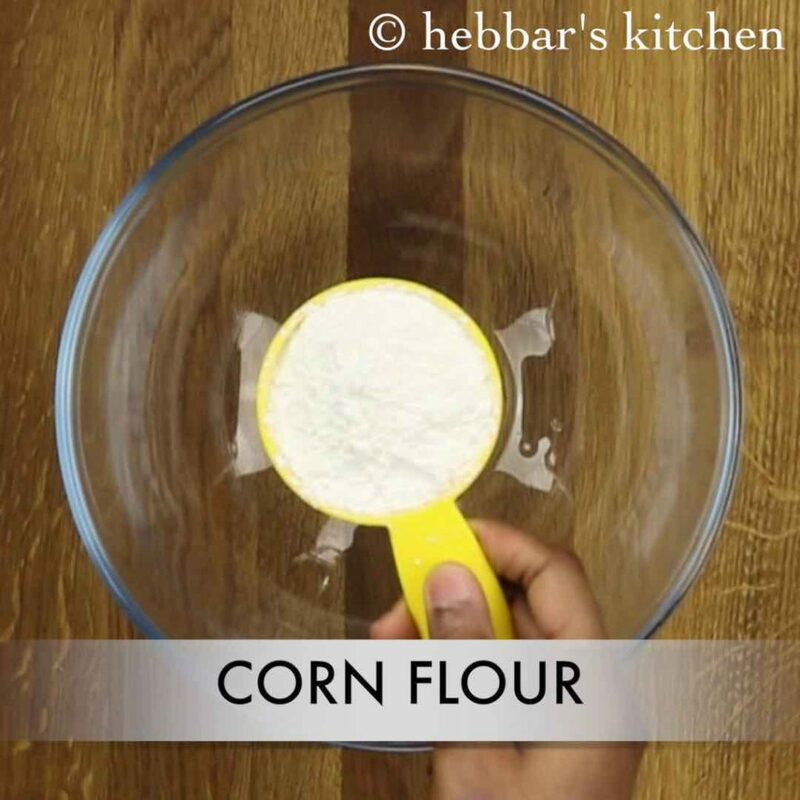 did you use corn starch or corn flour? Can we add vinegar instead of lemon juice? Keep up ur good work mam. Thanks fr the detaild recipe mam. i stay in hyderabad where salan is famous. I made bhindi ka salan and it came exactly both taste look and texture the way it is served in restuarants.thank you. Mind blowing recipe. I will surely try it soon . Keep it up . wow wowwww I was looking up your site for halwa recipe two days back.. n today its here n that too in my favorite color.. and my guess of making it also same.. Thanks friend uploading it to clear any doubts.. your web site is just like a complete personal class at your place.. Thanks a lot Susan… Glad you are enjoying our recipes… Pls try out and share your feedback..